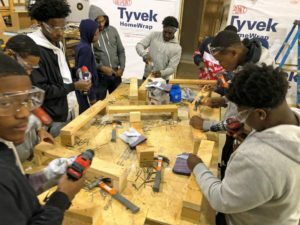 Sixteen teens from Boys & Girls Clubs of Cleveland will learn the construction trades and use those skills to rehabilitate houses this summer as part of an innovative workforce development program. Building Great Futures, a joint venture between BGCC, Greater Cleveland Habitat for Humanity and Youth Opportunities Unlimited, is introducing Cleveland high school students to careers available to them in the building and construction fields and related skilled trades. Youth in the program started training on April 28 and will help rehabilitate two Habitat for Humanity homes in Cleveland over the course of 10 weeks, from June 4 through Aug. 10. The workers – eight each from the BGCC teen centers at John Adams and East Tech high schools – will be paid $10 per hour. They will receive formal classroom training each Monday from Associated Builders and Contractors Inc. and work on homes, applying classroom instruction to the rehab of the Habitat homes. ABC is donating its facility and instructors’ time. “We think this is a terrific opportunity for our teens to learn construction and possibly even open a meaningful career path,” said Ron Soeder, president and CEO of Boys & Girls Clubs of Cleveland. Funding for the project will come from a donor who wishes to remain anonymous, according to Soeder. He said the donor is passionate about getting teens to learn how to work with their hands. Cuyahoga County is providing resources for case management, career coaching, and training/education through the County Internship Program. “I’m proud to work with YOU and the Boys and Girls Club to connect these young residents to a meaningful career exploration experience” said County Executive Armond Budish. Home Depot is providing a stipend for safety boots for all participants. At the project’s conclusion, each teen will receive his or her own tools and tool belt; they will be making their own toolboxes as part of their classroom training. Both homes being rehabbed are located on East 130th Street in the Mount Pleasant neighborhood, and are part of a larger neighborhood revitalization campaign being undertaken by Habitat in 2018. In all, eight houses will be fully rehabbed for new homeowners, and up to 100 existing residents assisted with exterior projects in that community. An interesting side note: One of the homes will be owned by the family of one of the teens in the program. 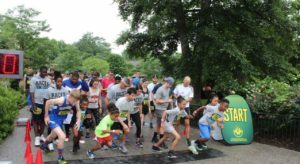 Boys & Girls Clubs of Cleveland provides safe, fun places for kids ages 6-18 after school at 14 locations throughout the city, focusing on healthy lifestyles, academic success and character development. Greater Cleveland Habitat for Humanity strengthens communities, restores homes, revitalizes local neighborhoods and invests in those who seek to become a homeowner. Habitat changed its model in 2013 and now fully rehabs vacant homes concentrated on the same street or in the same Cleveland neighborhood. Youth Opportunities Unlimited is a nonprofit workforce development organization based in Cleveland, Ohio that serves teens and young adults ages 14-24 living in economically distressed areas in Cuyahoga, Lorain, and Lake Counties. Cuyahoga County is committed to making the region vibrant and prosperous where everyone thrives and all things are possible.